BCA has been a firm advocate of Expressly for a while now, having invested in the previous round. The platform has onboarded over 250 advertisers and has started to gain traction with leading publishers Time Inc. & Global. They key go-to-market strategy is predicated upon securing deals with leading publishers. This round of funding will be used to expand the team’s sales and development capacity and deliver further publisher deals, with a view to a Series A in December. BCA’s advice and support has been invaluable to date and we look forward to marketing our capital raise alongside them. The team has provided introductions into the publishing space and worked closely with us to develop our investment strategy. We are really excited about the potential for Expressly and believe the regulatory drivers surrounding the industry strengthen the need for our platform. Expressly has been on our radar for some time now. In a world where traditional publishers are being marginalised by the tech giants, we firmly believe that this technology offers publishers a valuable new revenue stream. The founding team are passionate, committed and ready to scale. 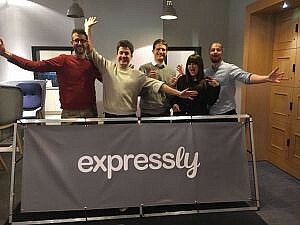 Expressly – www.buyexpressly.com – Expressly powers a revolutionary digital advertising technology that enables advertisers to target and convert registered users at partner publishers, via a compelling user experience. Leveraging data already at the publisher, users are engaged and converted via an elegant 1-click onboarding. For advertisers, this is the next level in digital advertising: never engage a fake user again, experience Facebook-level targeting capabilities, convert interest into lasting relationships. For publishers with existing databases, this leads to a new advertising product that advertiser want. For publishers with high traffic, but limited registered userbase, Expressly’s solution includes an additional step to grow the registered userbase on both sides. Bosham Capital Advisors (BCA) - www.boshamcapitaladvisors.com - is an independent investment, corporate finance and capital advisory firm, based in London, which acts as an advisory bridge between investors and investees in Asia & UK. BCA provides investment, corporate finance, strategic advisory, M&A and capital raising services across the digital-media, disruptive technology, consumer and real estate sectors.